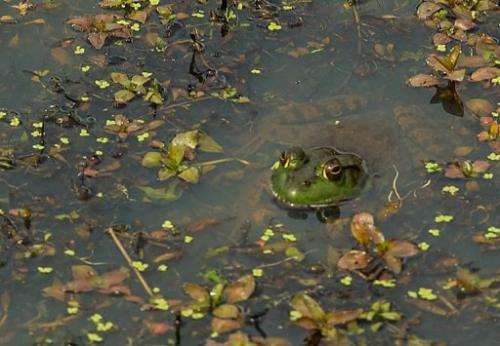 A frog peeks up from the water in a pond in Prince William County, Virginia on April 5, 2012. A plunge in the world's population of frogs and toads may be blamed, at least in part, on farm pesticides, researchers in Germany said on Thursday. According to the famous "Red List" of threatened biodiversity, 41 percent of frog and toad species are at risk of extinction. "The demonstrated toxicity is alarming and a large-scale negative effect of terrestrial pesticide exposure on amphibian populations seems likely," says the paper. "Terrestrial pesticide exposure might be underestimated as a driver of their decline.... The risk assessment procedures do not protect this vanishing animal group." "There are ways in which some of these pesticides might have a mechanism of action that would affect amphibians," said Colin Berry, emeritus professor of pathology at Queen Mary University in London. But, he cautioned, "these will differ between compounds and so would need examining carefully." I have an idea to solve this problem and save the amphibians, should I contact the researchers directly?